"I'm Going to Give You the Choice I Never Had"
Interview with the Vampire, That is what Journalist Daniel Malloy is about to have and it, will change his life forever. Singled out first for a meal, and then for some reason, to be the one that hears the story of Louis. Louis de Pointe Du Lac is the weaver of this unbelievable tale that is his life. Louis shares the trials of losing his wife back in 1791, his embrace into the 'dark gift' and the story that unfolds after. A story of love, betrayal, drama, passion, and mystery; and it all starts with his sire, and mentor, Lestat De Lioncourt. Who is the vampire that brought him over to be one of the night damned. Ann Rice has a cult following and so does her series of books, this is the only movie that she has ever had a hand in creating when it comes to her creations and it shows; because Queen of the Damned was utter garbage in comparison. Those who are looking for a gore filled horror show, stop reading now, and follow this link to from Dusk till Dawn or this one to Stake Land; and those of you looking for an intellectual movies with some deep hidden meaning, go watch any 'of the living dead' movies, they are full of social commentary. This movie, "Interview with the Vampire" has everything you need to know in the title. It is a drama, a movie that documents a fictional vampire’s life through his eyes. I am not, absolutely not, a Tom Cruise fan. I find him to be just a pretty face Hollywood likes to use; and it annoys me that it works for him. Brad Pitt is hit or miss for me, I liked a few of his movies, but lately it’s been on a bit of a down grade. Now, having said that, I must state that they both did a phenomenal job in Interview and impressed me. 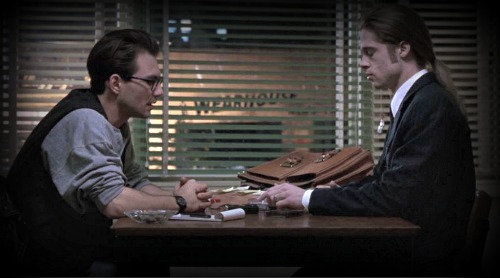 With Cruise playing the borderline sociopath vampire Lestat, and Pitt playing the lead vampire Louis, who clings to every shred of his humanity he can, the two have an on screen chemistry that is undeniable. The story is narrated by Louis as he speaks to Daniel Malloy about his life. 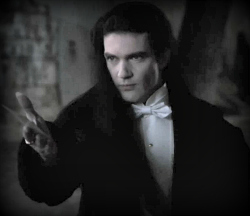 Antonio Banderas takes the role of Armand, thought to be "at over 400 years old, the oldest living vampire in the world"; and gives a remotely decent performance of an emotionless vampire trying to find a way to reconnect with the world. Though even with all of those big name stars one person stands out among them all as the show stealer. That honor goes to Kirsten Dunst, who is a absolute show stopper in her portrayal of Claudia. My Card. I am Armand, also puss... in boots. The young girl who broke the will of Louis, tricked even the most cleaver of vampires, and showed creativity and decorum when faced with those stronger than herself. 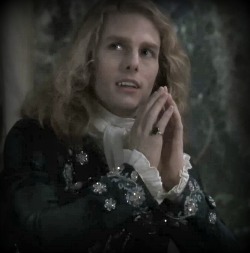 Lestat turned her into a vampire in a plot to keep Louis and Lestat together. This is, and deserves to be a 'modern day' classic vampire movie; rent it, buy it, barrow it, but watch it. The worst thing that can happen is you see a movie that when someone says 'have you seen...' you can say 'yes' but I promise you, unless you’re looking for gore or a deeper meaning, you won’t be disappointed. A drama laced with vampires; so to speak and full of gorgeous atmosphere and an Unforgettable Soundtrack . You can Buy Interview With The Vampire On DVD or On Blu-Ray . It is also available as a Direct Download From Amazon .